Exams. Love them or loathe them, they’re here for good. No matter how much you revise, prepare, and practice, chances are you’ll find a question you just can’t answer. Most of us would either leave it blank or just take a guess; some of us, though, will make a joke of the situation—and hilarity often ensues. While this student’s spelling might have room for improvement, there’s no arguing with their logical approach to answering the question: they were asked to explain the shape of the graph, and explain it they did! 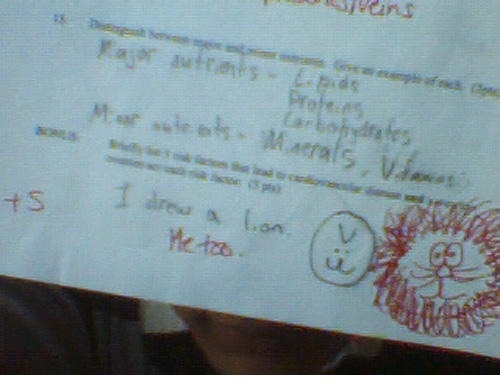 This is undeniably sweet, not least because the pupil’s drawing looks more like Charlie Brown of ‘Peanuts’ fame than a lion. 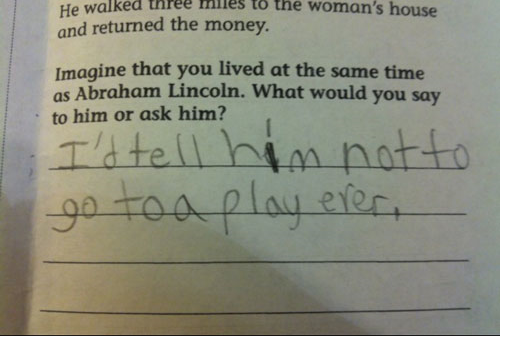 While the student seems to have misunderstood the concept of living ‘at the same time as Abraham Lincoln’ (meaning they’d have to be psychic to know Honest Abe’s ultimate fate), their answer is succinct, witty, and demonstrates an impressive grasp of history. While this answer’s leaning heavily on the ‘cheeky’ side, they’ve highlighted a genuine mistake in the question’s structure. We wonder how this was graded: on the one hand, they’re being pedantic; on the other, they’re spot-on. 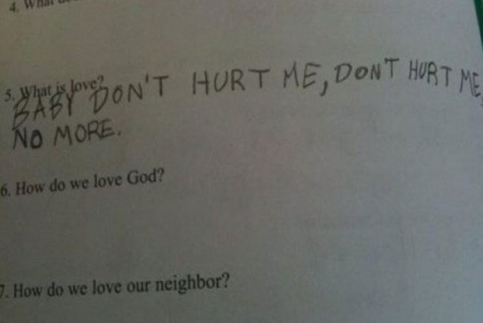 Echoing the memorable lyrics of Haddaway’s 90’s classic ‘What is Love?’, this student’s answer is a stroke of absolute genius. Given the subjective, philosophical nature of the question anyway, it’s tough to understand how someone could get the answer ‘wrong’. 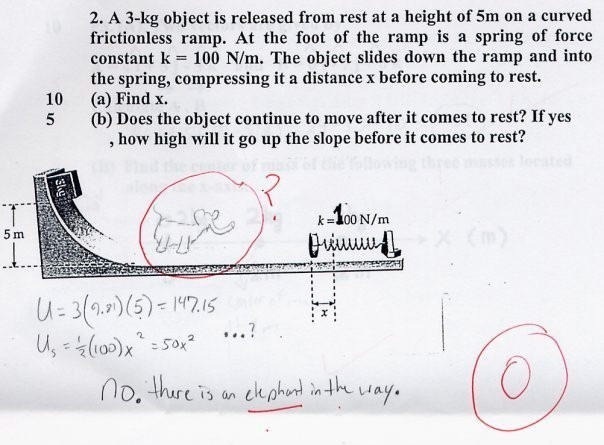 We hope they got full marks. How can this student receive anything but praise? 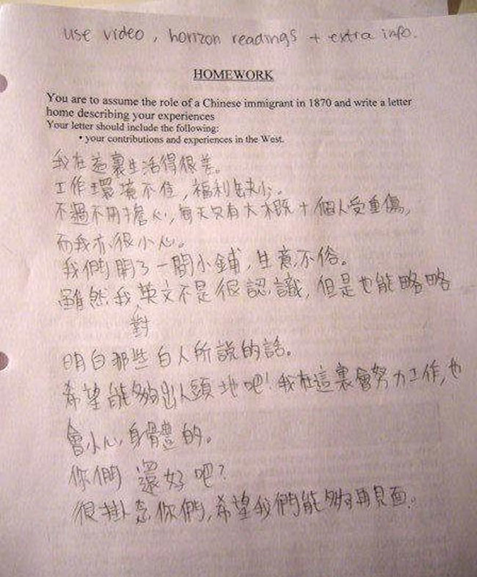 While we all know this isn’t what the question specified, the student has done as requested and assumed the role of the Chinese immigrant so deeply they’ve even adopted the language! 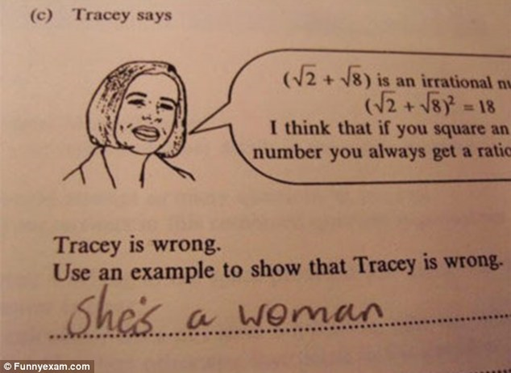 Sexism notwithstanding, there’s no denying this is funny. 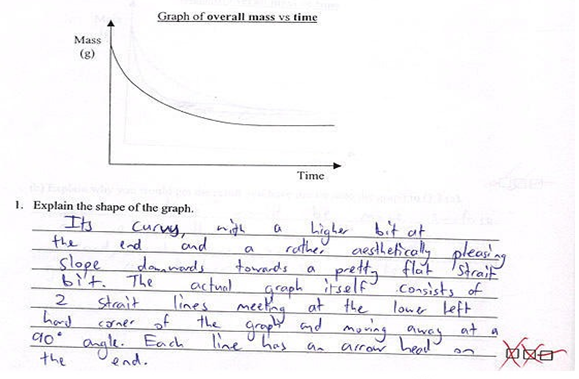 This is such a sweet answer, it’s hard to imagine the teacher being anything but charmed. Judging by their bold, underlined ‘not’, however, it’s safe to say they weren’t. While we’re unsure whether this is absolutely genuine or just for one of the most bizarre classes ever, this is nevertheless a fine example of great wit. Who can argue with some of the logic on display here? 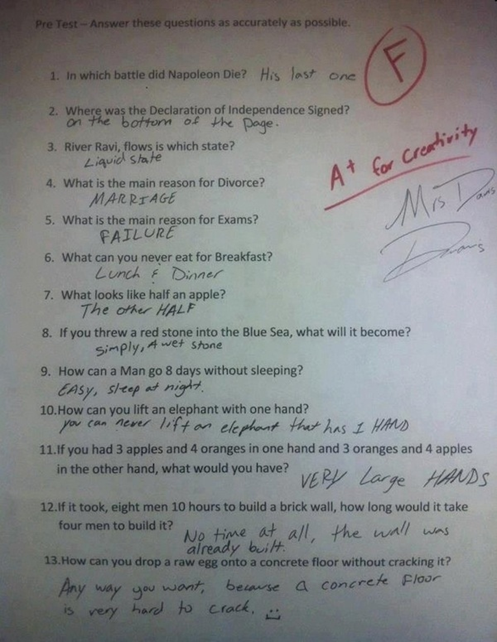 Answers 7, 9 and 11 are absolute gems, and the teacher seems to have appreciated it. The secret of success in business is not one that can be taught. Instead it is one that comes from within. Or at least that was the message from Mary Portas, the retail expert and TV star who hosted this years Small Business Showcase Awards. These suggestions could be both a blessing and a curse, allowing individuals to have far more control over their own destiny, but far less help on hand to guide them to the right conclusion. However, whilst certain signs may be saying to go one way, if your gut is telling you to do something different, it will indeed be important to trust those instincts over the more logical nature of the brain. In business, what will set you apart from a pack that all does the same thing is ignoring the route that everyone else will take and opting instead to follow what your intuition tells you. For SMEs, it is a dog eat dog world, and those only following logical paths formulated by ruminating on the pros and cons of a given issue are likely to fall behind. Obviously, there will be many times when such a cerebral approach is sensible, but if your gut is screaming at you to do something else, this deviation from logic could well be what makes you. How do you know if instinct is right? Another top tip from Portas is to employ “really great people.” This will help you to understand if your instincts are right. Guiding from the head and not the gut will lead to many anodyne decisions that see you stagnating early and never reaching your full potential. Leading from the gut when it overrules the brain is what will push you ever further and allow you to achieve your goals. By making sure that every member of your team is excellent at their given role, you will have individuals on hand to help guide your decision-making process. When making decisions about things you are not an expert on, having the opinions of those you can trust will be vital, whilst bouncing ideas off the same people when your instincts are telling you to make a certain decision will help you to see if that decision will indeed be the right move or is just a temporary blip of insanity. The secret to success is therefore likely to be all about ignoring what seems to make sense and following what you believe – just so long as every other member of your trusted team isn’t screaming warnings against it. Here at Simply Docs, we are aware just how important it is to do things your own way rather than enlisting the help of so-called experts who will not have the same financial or emotional investment in what you are trying to achieve. This is why we offer top-class business templates to help you create business documentation that suits your own unique approach to business, and not documents that so-called outside experts will end up interfering with. The Government has ended the Percentage Threshold Scheme (PTS) under which employers who suffered from high levels of sickness absence were able to reclaim a portion of their SSP payments. Using the money saved from PTS, which has been described by the DWP as “an outdated system which does nothing to promote or support active management of sickness absences by either the employer or employee”, the Government plans to set up a new Health and Work Service – expected to be set up by the end of the year – which will offer advice, voluntary medical assessments and treatment plans for employees who are off sick. The Government has estimated that the existing arrangements cost £50m per annum and that the new service will cost between £25m to £50m per annum. Taxable revenues are anticipated to increase by £100m to £215m. What’s the cost to employers? A recent survey by MetLife found that one in five SMEs suffers “serious disruption” as a result of staff illness, with employee absence costs taking up around 13% of payroll on average. Although the DWP argues that the “financial loss to business from the ending of the PTS will more than likely be offset by a reduction in lost working days, earlier return to work and increased economic output” some commentators are not reassured. David Heaton of accountants Baker Tilly fears that the inability to reclaim SSP will prove a “huge burden for a small business to bear” and could even result in some small businesses having to close. Meanwhile, speaking in the House of Lords, Baroness Sherlock noted that micro-employers could be particularly heavily hit by the changes. Will the Health and Work Service work? According to a leading independent occupational health adviser, there are not enough occupational health therapists to meet the timescale of the Health and Work Service and that proposed phone assessments could end up being “templated rubbish.” So it remains to be seen if the abolition of PTS will simply amount to a further challenge for SMEs without any effective replacement. What do you think – how will the changes affect your business?